Every engineer knows that the design process is not a straightforward one. For Emelina Vienneau, Diana Arguijo, Sarah Jacobs and Kayla Wright-Freeman, the serpentine route to a finished product was fresh in their minds as they presented their final senior design project, “A Breath of Fresh Air,” during the Spring 2018 Duke BME Design Symposium. 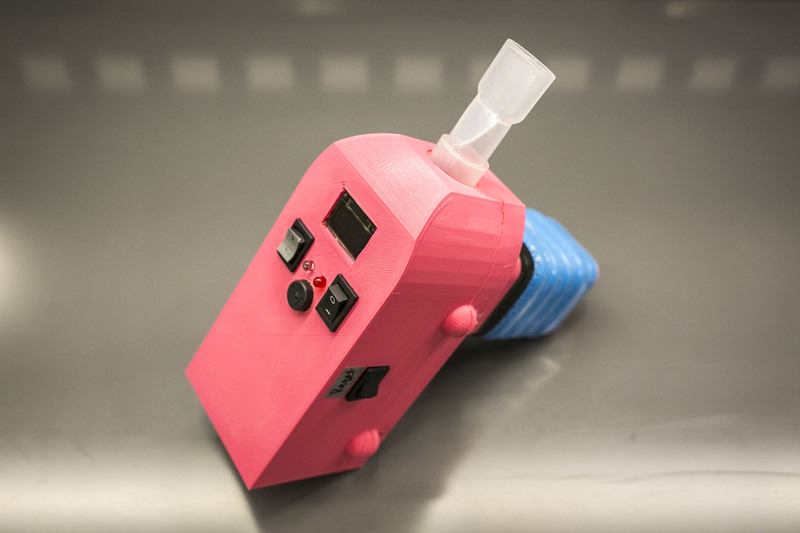 These biomedical engineering students had spent the better part of a year creating a respiratory muscle training (RMT) device before scrapping their initial design for a new one—less than a month before their final presenations. Typically, when people have weak respiratory muscles—common in conditions such as Pompe disease or COPD—physicians prescribe respiratory therapy that trains their lungs as they inhale and exhale against resistance, just as someone would lift weights to gain strength. Traditional RMT devices include a tube containing a spring-loaded threshold valve, which determines the air resistance. Patients inhale or exhale into the tube, using their lungs to create a pressure differential. Once the pressure meets the designated threshold, air will move through the tube and patients will have ‘exercised’ their respiratory muscles. But current RMT devices have drawbacks. Most use unidirectional valves, so patients need two separate devices to strengthen their inspiratory and expiratory muscles. The range of the spring-loaded valves is also limited, so the devices don’t always offer the resistance levels patients require. The team’s final design was specifically created to address these shortcomings. 3D-printed in bright pink filament, their RMT device boasts a single breathing tube containing a bidirectional motorized butterfly valve. The air tube also incorporates a differential pressure sensor that measures the flow rate within the tube to indicate a successful or unsuccessful breath. The Fresh Air team was among the first to pilot a new two-semester design program offered by Duke’s Department of Biomedical Engineering. Spearheaded by Mark Palmeri, a physician-engineer and professor of the practice in BME, the program offers an immersive design curriculum that challenges students to solve the real-world problems physicians encounter in medicine. The next step in the development of the new program took root when Palmeri and Chilkoti attended a 2016 lunch discussion with Duke neonatologists who talked about the technological gaps they experienced in their work. Within a year, Palmeri had organized a two-semester pilot program with master’s students focused on medical devices for neonatology. By the end of 2017, students had created projects including a modified stethoscope that could monitor cardiac abnormalities, a biometrics recording device that could track infant respiration and heart rate and send the information to a doctor’s phone, and a handheld scanner that used ultrasonic waves to examine bone density. Finding space for the new curriculum was the final challenge. "We wanted to create a space that served the needs of instructors and was a place that students were happy to work in," says Chilkoti. The team turned to the Chesterfield Building in downtown Durham, with shuttle service to and from Duke. Working with Marcus Henderson and Matt Brown, Duke BME’s laboratory instructors, the team created a customized design suite that would serve the needs for an immersive two-semester senior design course. “This was exciting for all of us, because we had taught students in retrofitted spaces for years. 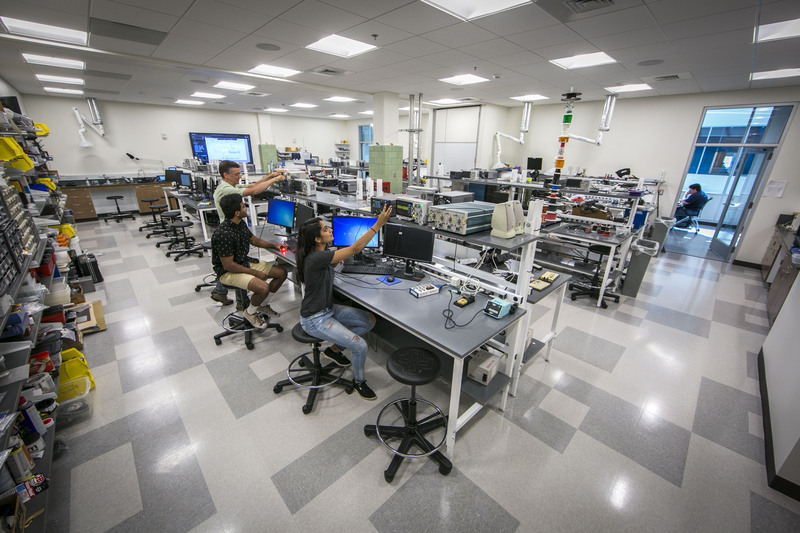 Now, following our inputs, architects had created a beautiful new lab expressly for teaching electronics and electronic design,” says Henderson. In the fall of 2017, Duke BME officially launched the two-semester design program for undergraduate students in the customized design suite. With Palmeri at the helm as the instructor and Brown spending much of his time at Chesterfield lending technical support, all the pieces for a new two-semester design experience were in place. Students first enroll in BME 590: Fundamentals of Design, where they choose a project and begin to collaborate with a physician to assess the needs and shadow them at Duke University Medical Center. The following spring, students take BME 464: Medical Device Design to begin the actual construction of their projects. Palmeri’s inaugural crop of design students spread across six projects and multiple disciplines. In the field of urology, one team created a device to help manage Vescicoureteral Reflux (VUR), the retrograde flow of urine from the bladder to the kidney. By creating a pressure transducer catheter, the team was able to measure the pressure changes at the bladder wall and calculate the length of the intramural ureter, helping surgeons more accurately estimate the amount of bulking agent needed to manage symptoms. Working with anesthesiologists, a group of students attempted to create an accurate and easy-to-use neuromuscular paralysis monitor to track the muscle relaxation of patients under general anesthesia. A second group sought to help anesthesiologists visualize the throat while inserting a breathing tube, creating a 3D-printed cage that encompassed a tiny camera. Another team worked with a laparoscopic surgeon to create a tool that would locate needles lost in a patient’s abdomen—a rare problem, but one that can cause severe complications if not quickly addressed. Physicians typically use intraoperative X-ray to search for lost needles, but the students designed a wand-like device equipped with a metal detection circuit to do the job more quickly. And patients aren’t the only ones who will benefit—three of Palmeri’s students worked with gastroenterologist Darin Dufault to help physicians themselves. Doctors who perform numerous endoscopies, it turns out, often experience musculoskeletal injuries during their careers due to the repetitive motions required by the work. By creating different sizes of dials, the students were able to make the endoscope more comfortable to hold and reduced the repetitive motions physicians would need to make with their hands and fingers, limiting their joint pain. “Through observation, feedback and numerous prototype iterations, we were able to develop a simple device that not only allows doctors with all sizes of hands to use safely and efficiently, but alleviates strain in the hand and maintains increased operator safety, even after a long day of procedures,” says Hannah Grossman, one of the students from the team. "No we've got a viable product with applications that extend beyond our initial intentions—and that is something the team is proud of." Just a year into the design program, student interest is exceeding expectations. There are already plans to do just that. 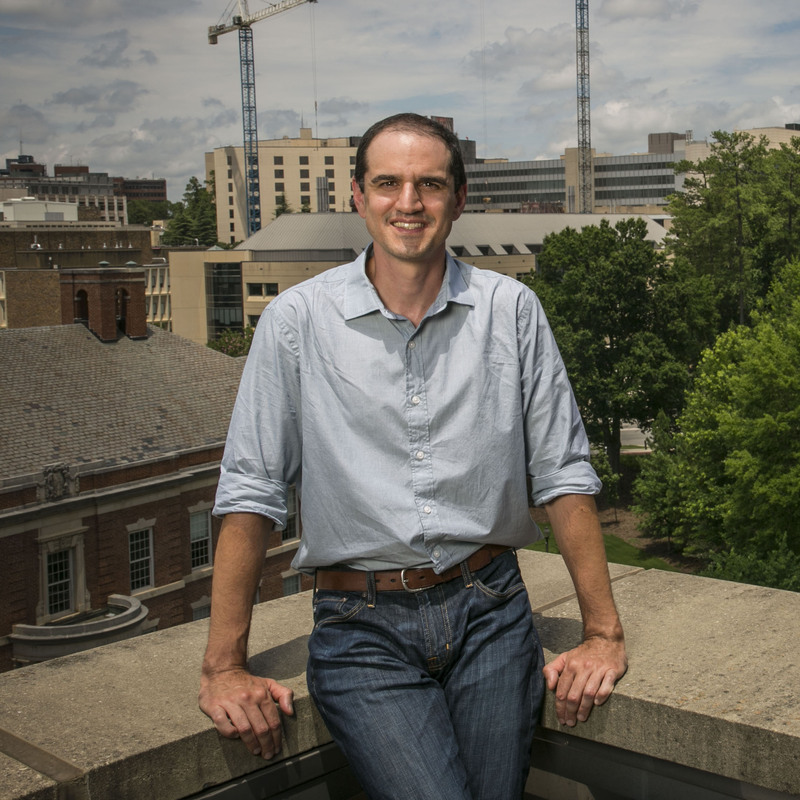 BME's Kevin Caves and Robert Malkin have already expanded their design courses into two-semester programs, and new faculty member Eric Richardson will teach his own section of the course. Palmeri will also expand the projects students can work on in his own course, with plans to bring back some of the neonatology devices from the pilot program and introduce more collaborations with MEDx partners. "When students graduate and go on to jobs, it's programs like this that allow them to hit the ground running." The program has also captured the interest of Robin Rasor, the executive director of Duke University’s Office for Licensing and Ventures. After learning about the ergonomic endoscope project, Rasor met with the team and gave them advice about how they could commercialize their design for widespread use. Duke OLV also filed a patent application to protect their technology, as well as for the respiratory device developed by Vienneau and her team. For Palmeri, seeing his students’ success confirms the need for more immersive design programs that can prepare graduating students for jobs in industry.